If you can't make it to Disney On Ice this year, the Disney Fairies Film Festival may offer you an affordable alternative. Just in time for winter, catch a winter themed fairy film as Tink heads into the Winter Woods, and, with the help of her friends, discovers the secret of sisterhood, and The Secret of the Wings. If Periwinkle, Silvermist, Sled, and Spike are household names at your place, mark 7-22 June in your diary and book tickets to a magical Fairies Film Festival, screening exclusively at selected HOYTS Cinemas. From Pixie Hollow to England, to the seven seas, discover the magic of true friendship, humility, and love, with Tinker Bell and her fairy friends. 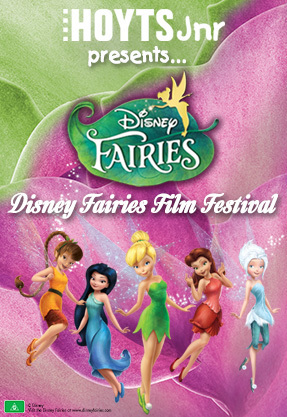 Hoyts is offering a limited number of free Disney Fairies activity booklets with every ticket purchased to any film in the Disney Fairies Film Festival. In the meantime, or in case they run out, click here for an endless supply of free printables, games, and activities for the tiny Tink in your life. After the Fairy Film Festival, Tinker Bell and the Pirate Fairy will be swashbuckling its way to cinemas, coming 26 June 26. The misunderstood Zarina (voice of Christina Hendricks) is the newest Disney fairy, a smart and ambitious dust-keeper fairy, who's captivated by Blue Pixie Dust and its endless possibilities. 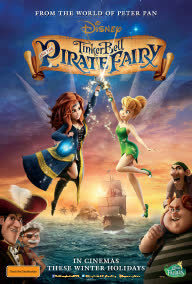 When Zarina steals Pixie Hollow's blue pixie dust, and flies away the the pirates of Skull Rock, Tinker Bell and her fairy friends venture away from the Hollow on a harrowing adventure of epic proportions. Find out what happens in Tinker Bell and the Pirate Fairy this winter school holidays. Standard ticket prices apply for Tinker Bell and the Pirate Fairy, releasing from 26 June for NSW, VIC and QLD only. Film will be releasing on 3 July in WA, SA and ACT.